Mitsubishi announced a fifth delay in delivering the MRJ passenger jet — which is undergoing tests in Moses Lake — and about a 30 percent jump in development costs, raising concerns about winning new orders for the single-aisle plane. Mitsubishi Heavy Industries announced a fifth delay in handing over Japan’s first locally made passenger jet to airlines and about a 30 percent jump in development costs, raising concerns about winning new orders for the single-aisle plane. Launch customer ANA Holdings will get the Mitsubishi Regional Jet (MRJ) in 2020, two years later than the current estimate, Mitsubishi said in Tokyo on Monday. St. George, Utah-based SkyWest is the plane’s biggest customer. Revision of some electrical configuration to meet certification requirements prompted the latest pushback of the deadline. The Japanese conglomerate has brought in bullet-train engineers and flown the jets to Moses Lake to speed up certification as it attempts to break into the dominance of Brazil’s Embraer and Canada’s Bombardier in the market for aircraft with fewer than 100 seats. The delay is “debilitating” for Mitsubishi, said Saj Ahmad, an analyst at London-based StrategicAero Research. On Monday, Mitsubishi Chief Executive Officer Shunichi Miyanaga didn’t say from what base the costs were going up. The company’s Chief Financial Officer Masanori Koguchi said in June the jet’s development costs had already tripled to as much as 600 billion yen ($5.3 billion) from initial estimates. Miyanaga declined to provide new financial data on costs. 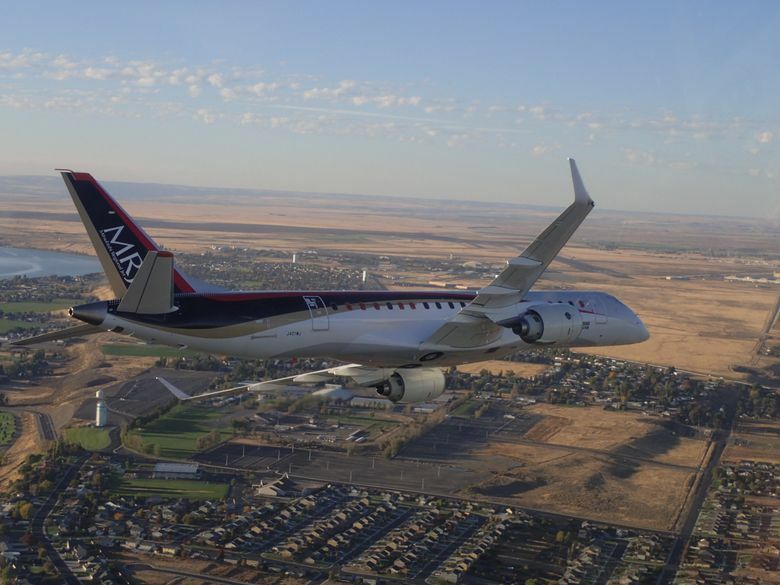 Mitsubishi Aircraft has flown three MRJ planes to Moses Lake for testing, following setbacks last year. Even with the delays, Mitsubishi has an advantage because it’s developing an aircraft with a new design, a company spokeswoman said. Mitsubishi will eventually employ some 400 people between Moses Lake and Seattle, where it has a local engineering office. Mitsubishi Aircraft, a subsidiary of the conglomerate, has 447 orders for the plane, including options and purchase rights. ANA, the operator of Japan’s biggest airline, said it was “disappointed” at this latest delay, but will continue to support the development of the jet as its launch customer. “We remain confident of the benefits the MRJ will bring to the ANA fleet in terms of performance and passenger comfort,” the carrier said in an email statement. It has 25 of the planes on order, including options. SkyWest has an order for 200 planes including options. The plane builder also has as many as 100 orders from Trans States Airlines also based in the U.S. The jet, which can seat as many as 92 people, made its first flight in 2015 and won its first order from a European company in February. Japan’s last locally produced commercial aircraft was the YS-11, a turboprop made by Nihon Aircraft Manufacturing, a consortium that included Mitsubishi Heavy, Kawasaki Heavy Industries and Fuji Heavy Industries. Production was stopped in 1974 after 182 of the planes were sold. Information from Seattle Times archives and Bloomberg reporter Anurag Kotoky is included in this report.